I'm going to keep today's post short and sweet, since I'm still recovering from the events and festivities of Feast Portland. For those of you who followed along on Twitter and Instagram, thanks so much for putting up with my festival updates and pictures! I know it's probably not the funnest to see pictures from an event you're not at, so thanks for all the likes and comments anyway. 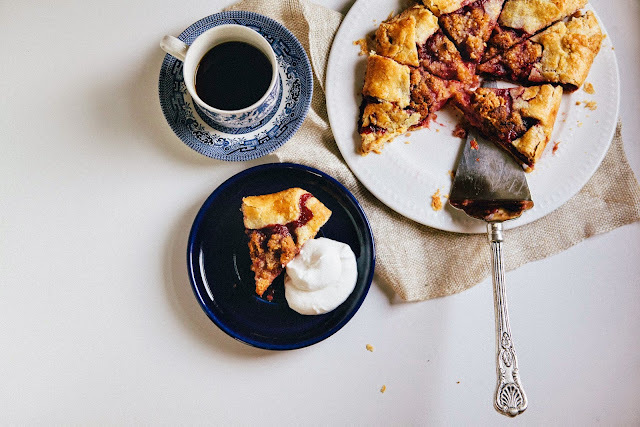 If you're unfamiliar with galettes, they're basically free-form pies; that is, all the flaky, buttery, crispness of pie crust minus the hassle of molding the dough into a pie tin and dealing with lattice tops and artful edges. I hate admitting this (especially as a desserts blogger), but I've never been able to master lattice crusts — mine always look too messy and bleedy and blurgh. But with a galette, that's kind of the look you're going for. The sloppyness in my pie making skills becomes beautifully rustic, wouldn't you say? For fun, I topped the plum galette with marzipan crumble. The marzipan crumble adds a sweetness to the plums, which can sometimes turn tart and sour during the baking process. I also added a touch of toasted almond flour to really highlight the marzipan candy's subtle, nutty aromas. All of this rests on this wonderful crunchy cornmeal crust, a recipe I've had for a while but kept close to my heart as a secret weapon. When served warm, fresh from the oven with some vanilla whipped cream? It's absolutely perfect. This recipe works with a variety of different summer fruits, especially stone fruits like plums and berries. You can experiment with different combinations and quantities of fruit, just be sure to adjust the quantity of granulated sugar accordingly. The amount of sugar you use should also depend on the fruit's ripeness — because my plums were overripe, I used a small amount of granulated sugar and added no additional liquid. If you're working with underipened fruit, throw in more sugar and tablespoon or two of lemon juice. I wrote the recipe for the cornmeal galette dough and the marzipan crumble the way I made it, which was using a food processor. I know that not everybody has a food processor though (and to be fair, I only got my food processor like two months ago), so you can also cut the ingredients together using a pastry blender, two knives, or even your hands. You might have a little marzipan crumble leftover, because I am crazy and piled it on like whoa. If you have extra, you can preserve the unbaked crumbs in an airtight container in the fridge for up to 3 weeks. It also works well on apple crisps! Lay out a large piece of plastic wrap on a clean work surface. Turn out the dough onto the plastic wrap, and work quickly to bring the dough together into a small mound, handling it as little as possible. When you've got a mound (it's okay to have a couple stray pieces), wrap the plastic around the mound. Flatten with the back of your palm and refrigerate for at least 1 hour before using. While the dough is chilling, make the marzipan crumble. Break the 5 ounces marzipan into small pieces and place in the bowl of a food processor. Pulse a few times, before adding 2 tablespoons almond meal through the feed tube, pulsing to blend. Continue pulsing and add 1 tablespoon cold butter and 1 tablespoon granulated sugar. DO NOT PROCESS FOR MORE THAN A FEW SECONDS AT A TIME — stop pulsing when the crumble is in pea-sized clusters. Dust a clean work surface with a combination of all-purpose flour and cornmeal. Roll out the chilled cornmeal dough to a 12-inch round, about 1/8 inch thick. Transfer the dough to a large, parchment-lined baking sheet and refrigerate until ready to use. In a small bowl, combine 1/4 cup granulated sugar and zest from 1 medium orange by using your hand to rub the zest into the sugar. This will help release the oils from the zest and make the sugar more fragrant and flavorful. Set aside. In a large bowl, gently toss together 1 1/2 pounds pitted and sliced plums, granulated sugar and zest (from the 2nd step), 1/4 cup cornstarch and 1/4 teaspoon kosher salt. Measure out half the marzipan crumble and sprinkle it over the fruit mixture, tossing until the marzipan crumbs have evenly dispersed throughout the mixture. Immediately transfer to the prepared galette dough, arranging the fruit mixture in the center of the rolled out dough but leaving a 2-inch border all the way around the circle. Fold border over the fruit mixture, overlapping when necessary and pressing gently to adhere to the folds. Crack open 1 egg in a small bowl and gently whisk until the yolk has incorporated into the weights. Brush the crimped border of the galette with the beaten egg. Sprinkle the remaining marzipan crumble over the galette, and transfer to the preheated oven. Bake for 1 hour, until the crust is golden brown and the juices are bubbling. Check the galette 15 minutes into baking; if the marzipan crumble is browning too quickly, cover the baking sheet loosely with aluminum foil, creating a "tent". Once the galette is finished, transfer the baking sheet to a wire rack and allow the galette to cool on the sheet on the rack. Serve warm. 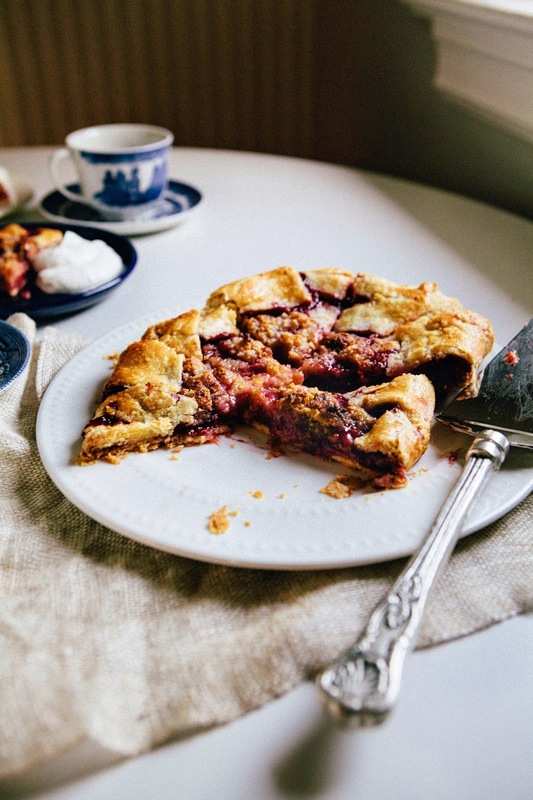 whether your edges look messy or artful , this pie combines some of my most loved cold(er) season ingredients, plums, marzipan & crumble (or streusel, as we would call them in German). 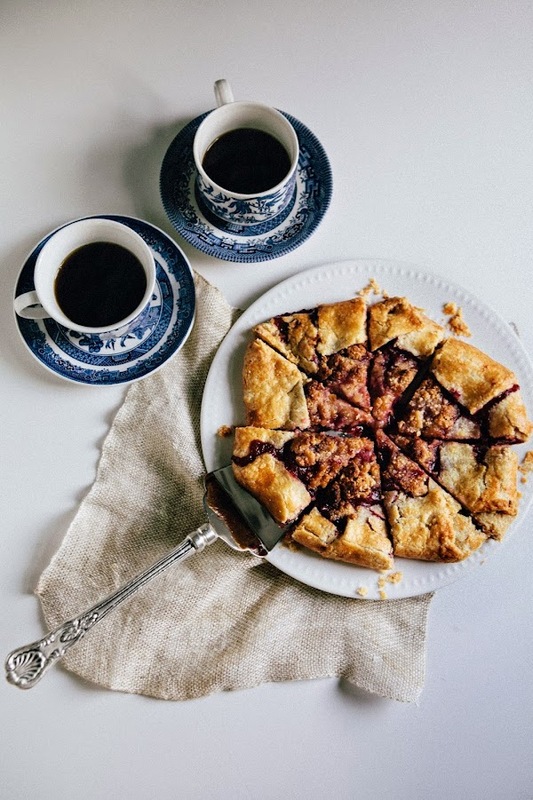 Love your streusel pie-galette-whatever! haha my favorite is "somehow i managed to buy a pound of plums" ha! Looks amazing as always. YOU HAD ME AT MARZIPAN!!! p.s. i am totally calling this a sugar plum and marzipan galette and having a nutcracker party about it. I feel you girl! I'm still recovering from IFBC. My head is swirling with ideas and I'm still coming out of my food coma! This galette is gorgeous. Love the combo of plum and marzipan! I'm a big fan of the galette - life is too short to spend it faffing around with lattice crusts. 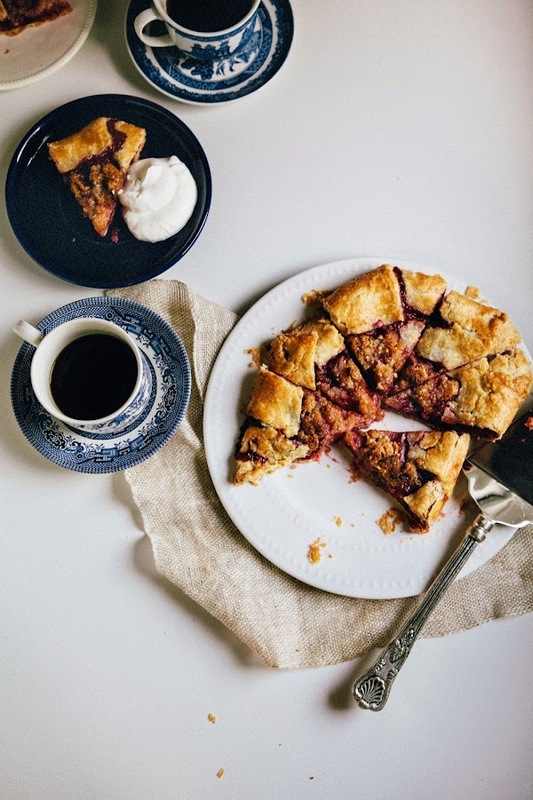 I've never thought of topping a galette with a crumble though; that's genius! I love galettes - they look beautiful and are so much more forgiving than regular tarts. Yours looks lovely, the marzipan crumble adds a nice touch! Oh my gosh, everything about this is perfection. 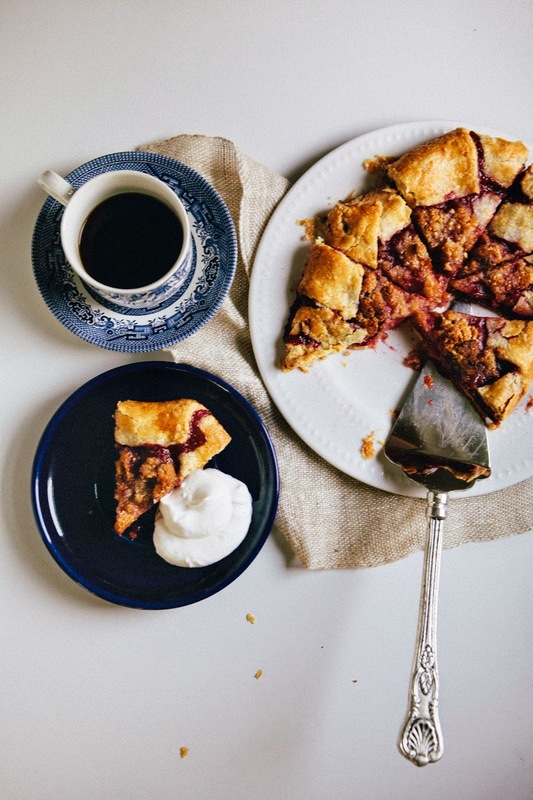 I'm obsessed with the idea of that marzipan crumble and your galette crust is GORGEOUS. 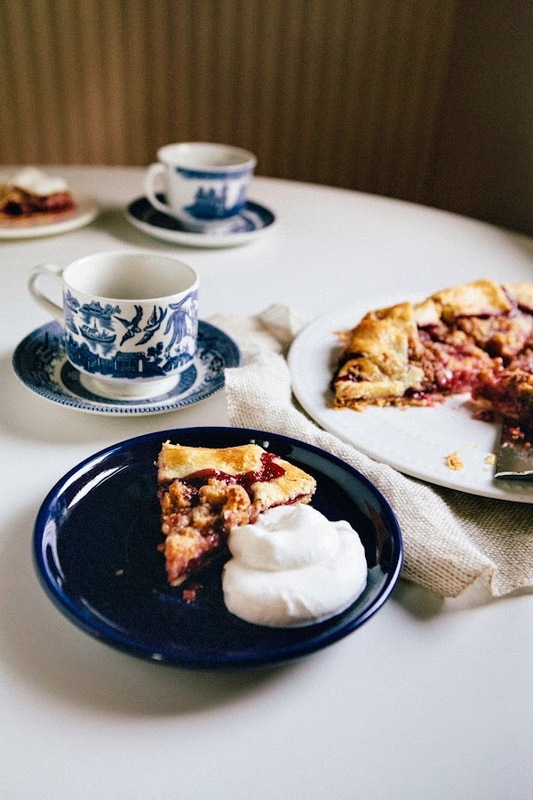 I'm with you -- galettes over pie any day! Sooo nice....I've been sooooo obsessed with galettes without even having made one YET! Haha, ever had one of those foodie obsessions because you KNOW the food is good? :P This is beautiful and I'm sure all your readers appreciate your baker's notes. There's never room for not learning something new when it comes to baking! Woah! This is awesome. I love marzipan so much and I'm all for galettes. I'm a terrible pie maker so galettes work for me. Play to your strengths n all that. This is such a cozy post! I've never had marzipan in a galette before. Love the idea.